The Special Collections at the Fort Collins Local History Archive include written materials, photo albums, scrapbooks, and other items that pertain to a particular family, business, or organization. These collections often contain primary source materials that offer unique views into local history. Contents of the majority of Special Collections are not digitized, but most boxes have detailed inventories and/or finding aids online. 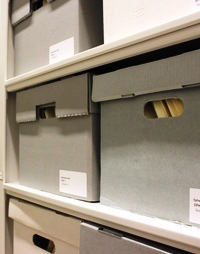 Since Special Collections are stored in archival boxes both on-site in the Archive and off-site in a storage facility, please contact us for an appointment to research these collections. It takes two to three business days to retrieve boxes from storage.